Ladakh comes alive only during the brief summer months, and it tries to maximise what is essentially its only income generating activity — tourism. Leh town is full of guest houses, but even then — and especially with tourists hesitating to travel to Kashmir — it is difficult to find accommodation during the peak summer months. 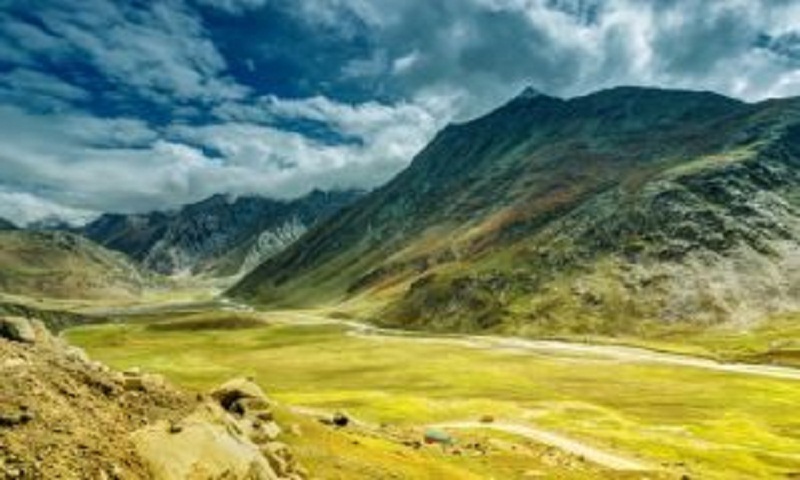 Conventional wisdom says that one must lie down and take rest for at least the first 24 hours after reaching Ladakh in order to allow the body to acclimatise to the reduced oxygen levels. Ladakh is a land of gompas, chortens and monasteries. The Hemis monastery is set against a wildly beautiful landscape, the mysteriousness enhanced by the myth of being the place where Jesus Christ spent the “lost years”. Thiksey Monastery is known as the mini-Potala of India, resembling its grander Tibetan counterpart in architectural terms, and has a wonderful museum housed within its precincts. It also has a very beautiful and large representation of the Padmasambhava. Lamayuru monastery is built on top of the still-visible caves in which the earliest monks resided, and can be reached only after traversing a wonderful moonscapelike land. A personal favourite was the Alchi Monastery. It is really beautiful, set in a complex with a little garden inside, and a wonderful three-storey temple with lovely paintings. The flea market just outside the monastery only added to the charm of the place. The beautiful Diskit Monastery, set in the charming Nubra Valley, with a huge statue of the Buddha and a marvelous view over the valley, is in a class of its own. Ladakh, however, is not only about monasteries. It is a land of adventures, whether you are travelling in a car or on bikes. It is a vast and beautiful landscape, punctuated all through by the River Indus and its tributaries. The Kargil War of 1999 is a constant refrain, whether in the noticeable presence of the Army or the restrictions placed on movements near the border areas. It does not intrude, however, on eyes which are too busy drinking in the novelty of a very different kind of landscape. The cragginess of the mountains on the road to Lamayuru, which ultimately goes on to Kargil, changes completely when you travel to the green Nubra Valley. It was pretty cold by the time we reached the Valley and never had a plate of Maggi tasted so delicious! The valley is watered by the Shyok River, a tributary of the Indus, which rises from the Rimo Glacier and traverses Northern Ladakh before crossing into Pakistan. Hunder, here has sand dunes high up amongst the mountain peaks — a clear pointer to the geological history of the Himalayan range. And that was not the only surprise. There are camels in the area, and these are two-humped camels, distinct from the Indian breed and tracing their ancestry back to Bactria. Their presence is accounted for by the fact that the Nubra-Shyok valleys were once part of the Silk Trade route to Central Asia and these camels were the chosen beasts of burden for the traders who travelled theses routes with their merchandise. Charasa. It lay on the road to Panamik, beyond which tourists are not allowed and further beyond which lay the Siachen base camp. Pangong Tso is situated at a height of approximately 14270 ft and is 134 kms long, with almost 60 per cent lying in China. The Line of Actual Control passes through the lake and there are occasional incursions from the Chinese side. The water is brackish and there is, therefore, no aquatic life in the lake, although birds abound. It is, in fact, the world’s highest salt water lake. The last day in Leh was given over to local sight-seeing. One visited the ancient Leh Palace, built in the 17th century on the lines of the Potala Palace in Lhasa. The palace is now abandoned and ruined, although presently, it is undergoing restoration, and remains a lovely piece of architecture. Shanti Stupa, a peaceful structure built with Japanese funds and with a panoramic view of the surrounding mountains. The flight back took one over Rohtang Pass, and the mountain scenery continued to be beautiful.